The Highland scene has very little "down time" however the first part of the year usually has dancers getting a break from competitions, Christmas and Burns Night functions. This is a good time for me to play catch-up on questions from "Dancer's" many, many readers. This moment in time finds me extremely angry with myself for procrastinating on a column that I had fully intended to pursue earlier in the year. Like so many times when you procrastinate the opportunity passes you by. "Bobby Watson, King of Highland Dancing Dies" so reads on the many of the tributes from Great Britain's newspapers. I had hoped to contact and to write about this wonderful, colorful man, his life, to get his views on today's dancing, his stories and his humor. Over the years the names of many of Highland's "Greats" have mentioned the dancer "Bobby Watson". His 83 years saw 81 of them involved with Highland dance. Bobby started in the art form at the age of 2. In fact, he won his first medal at the age of 3. "Bobby" even the usage of his name tells you how reachable the man was, not Robert or Mr. but Bobby! He taught up until last year and his expertise was in demand as far away as Australia, Japan and New Zealand. Indeed, his funeral in Aberdeen saw tributes from Scottish Country dancers and Highland dancers from all over the world. Accolades in abundance throughout his 83 years. Apart from teaching thousands of children through the years, winning hundreds of titles, two television shows, the 1988 bicentennial celebrations in Australia (Grand Australasian Highland Dancing Championship) and of course he was a World Champion." 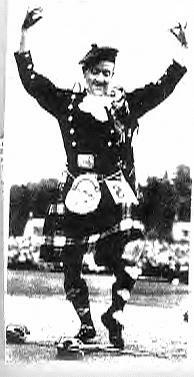 Bobby was not only a champion Highland Dancer and leading teacher and judge but also one of Scotland's cultural ambassadors" (Evening Express Newspapers) The late King George VI, who requested Bobby to instruct the local children in Braemar and Ballater areas to maintain the tradition, recognized indeed his expertise in performance and teaching. The world has lost another champion and dance has lost a "Champion of Highland". Note. Bobby Watson was an "Independent adjudicator". The Scottish Traditions of Dance Trust 2001 are planning a tribute to Bobby Watson this year.